Lightning does strike twice as, for the second time in recent months, I have made the mistake of judging a book by its cover (and in this case by its title as well). I am not generally a fan of cricket fiction, nor for that matter crime fiction, although I am familiar with the life and works of Sir Arthur Conan Doyle. This is in part because Conan Doyle was a good enough cricketer to appear in ten First Class matches and also because his fictional detective Sherlock Holmes is, for me, the exception that proves the rule as far as crime fiction is concerned. 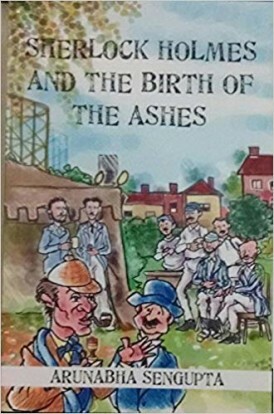 Against that background I assumed, Holmes appearing in the title and a cartoon from the renowned Indian caricaturist Austin Coutinho on the cover, that Sherlock Holmes and the Birth of the Ashes was simply a story. In truth however the book is based on a splendid account of the second and final day of the famous Test match at the Oval in 1882 that, known as ‘Spofforth’s Match’, gave rise to the legend that has become the Ashes. There are plenty of accounts around of the match. They tell of how on the first day England skittled the old enemy for just 63. The Australians, as they almost always have, struck back and bowled England out by the close, although in the context of the match an English lead of 38 seemed significant. On the second day Australian opener Hugh Massie made the only half century of the match, and indeed his Test career. After that England in turn hit back and, tellingly, WG Grace ran out the 21 year old Sammy Jones in a move of questionable sportsmanship. England’s target was eventually 85, and they got to 51-2 before Spofforth, with a little help from Harry Boyle, turned the match round and the Australians got home by seven runs. As far as the description of the match is concerned that really cannot be faulted. It is written from the perspective of Dr Watson, and it is difficult to believe that the writer of the account was not actually present at the match. The elements of the story that involve Holmes, based on factual incidents outside of the play itself (including a sudden death) allow Sengupta to show off a different side to his writing. Whilst I would not claim to be a ‘Holmesian’ I have read enough of Conan Doyle’s work to be familiar with his style and, had I not known different, I would have been quite happy to accept that Sir Arthur himself was the author. I do have one slight criticism of Sherlock Holmes and the Birth of the Ashes, which is the absence of a list of sources, as it would be fascinating to know where the material came from. It must be a long list as well as the research has clearly been extensive. For example as a student of the game I do know that the oldest cricket book known to still exist (as opposed to a collection of scores) was written by a German and published in Germany in 1796. I only twigged that one a few weeks ago however, but as the famous detective knew all about JCF Gutsmuths’ Spiele zur Übung und Erholung des Körpers und Geistes, he can only have learnt of it from Sengupta. So I have to confess that I rather messed up by dismissing Sherlock Holmes and the Birth of the Ashes out of hand, particularly as I am reminded by the couple of pages of acknowledgements in the book that I was tipped off about it by a man as eminent as Stephen Chalke who, in our Book of the Year feature for 2017 told us; the best cricket book I’ve read in the last two or three years is ‘Sherlock Holmes and the Birth of the Ashes’ by Arunabha Sengupta. I’m really disappointed that nobody has given it the publicity it deserves. It’s so original, a wonderful conceit, and it’s based on terrific research on late Victorian cricket and on the London of Sherlock Holmes.